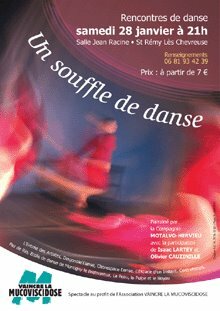 Christine danced at the “Espace Jean Racine” on Saturday the 28th of January in a show titled “Un Souffle de Danse”. This translates to a breath or an inspiration of dance. It really was inspiring for the kids and I to see mommy dance on the lighted stage in a real full blown production. It started at 9 PM so the kids had to say up a bit past their bedtime. But we made an exception to the regular 8:30 PM rule. Also, Gabrielle’s friends Samantha and Marlenè and their mothers stayed up a little late to come see the performance. The proceeds of the event went to the Muscular Dystrophy Association. Christine performed in two of the numbers to the almost full house. First she performed Belfast and then she performed Fugit Amor. In Belefast Christine, dressed as a Irish boy, was able to do quite a bit of improvisation in the unhurried opening of the number’s music. 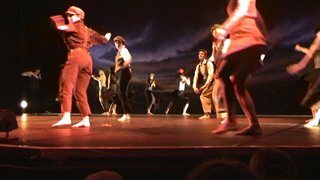 Then all of a sudden the music and the ensemble of 20 dancers exploded to life in Riverdance like fashion. 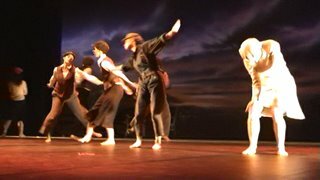 They took over the stage with a complex and well choreographed series of interweaving crisscrossings perfectly timed with Peter Gabriel’s upbeat music. It was amazing. In Fugit Amor Christine along with her friend and fellow dancer Désiré were able show the power or dance as a medium to express emotion. The title of this number probably inspired by Auguste Rodin’s sculpture of the same title translates to flying or fleeting love. Christine and Désiré along with 4 other members of the dance company Corps et Âme expressed in contemporary dance movements how the powerful emotions of love can come on so quickly and powerfully and yet sometimes be so fleeting and mysterious. Well, that is at least my interpretation. I wonder what the kids thought. Did they make the same analysis that daddy did or where they just happy to see mommy up on stage and stay up past bedtime?